When I work on e-Commerce optimization projects, I often take clients through several examples of what I consider to be e-Commerce excellence. While I go through this process, it usually doesn’t take long before I mention Amazon.com. Amazon consistently exceeds my expectations with selection, ease of use, access, security, and customer service. I’ve written previously about how strong Amazon is, including a post last year about mobile e-Commerce. I explained how Amazon blurred the line between making a purchase via your browser and your mobile device. It’s just another example of how Amazon goes above and beyond to ensure customers can access, browse and purchase across devices. So, after placing yet another order with Amazon late last week, I started to think about the reasons I visit Amazon over other e-Commerce websites. I also started to think about how those reasons apply to other websites (and possibly yours). In your industry, are you the knee-jerk reaction for buying online? It’s such a basic question, but can mean the difference between thousands or millions of dollars in revenue… Do customers think of your business first when they need to buy something? For me, Amazon is often the first website that comes to mind, and there are several reasons for this. As I was writing down the core reasons that I buy at Amazon so much versus other websites, I noticed that I was inadvertently listing the pillars of e-Commerce excellence. More on this shortly. Last Friday I needed to buy something quickly. I was in between meetings and only had a few minutes. Literally the first business that came to mind was Amazon.com. I could have purchased the item at a number of websites, but Amazon was my knee-jerk reaction. I also could have stopped on my way home, but Friday evening and New Jersey traffic don’t mix well, to say the least. So I opened up a new tab in Firefox, accessed the website, searched for the product, visited the product detail page and added it to my cart. I then quickly checked out and completed the purchase in less than 90 seconds. From an e-Commerce perspective, that’s simply outstanding. I closed the tab, received a confirmation email and was back on another conference call. Then, less than two hours later, I received a shipment notification. OK, remember the pillars I mentioned above? Let’s take a look at each pillar of e-Commerce excellence and how Amazon has successfully achieved a first-in-mind advantage. Amazon.com makes it easy to access their website across devices. 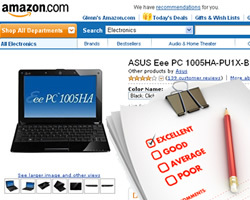 Amazon also makes it simple to find products, read reviews, view product information, check technical specs, find out what other people have purchased, etc. 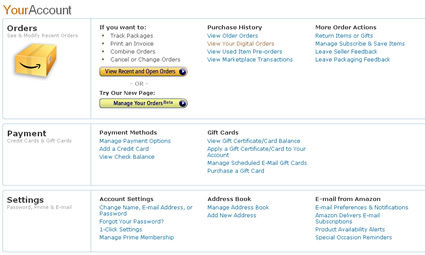 On Amazon, I’m able to visit the site, search for what I need quickly, and view all of the necessary information in order to make a purchase decision. There are no hoops to jump through, and I don’t necessarily need to be in front of my computer to buy something. Security is a big concern in e-Commerce, and it will only become a bigger concern as time goes on and technology progresses. For e-Commerce managers, a lack of security and trust can become a horrible barrier to conversion. However, if you can have prospective customers feel confident that their security is first and foremost, then you can reap great rewards revenue-wise. I always feel 100% confident when I’m buying at Amazon. If you put yourself in the mind of a consumer (and not a marketer), you can quickly understand how people browse through sites and what might be a problem conversion-wise. Some questions pop up like “who owns this site?”, “how long have they been around?”, “where are they located?”, “what happens if I need to return something?”, “how secure is this website?” …so on and so forth. The more you build trust, the easier it is for a person to click “Buy now” or “Proceed to Checkout”. Personally, I don’t even think about security when I’m on Amazon. That’s how much trust they have built up with me. I’ll cover my points system later in the post. So yes, Amazon is the proverbial knee-jerk reaction when I need to buy something online. And I’m sure it won’t surprise you to know that Amazon is probably the knee-jerk reaction for thousands of other people too. But they deserve it and have quite a few G-Squared rollover points to play with. 1. In your industry, is your business the knee-jerk reaction for buying online? If not, which company is? What can you do to get closer? 2. How does your business fare when it comes to the four pillars of e-Commerce excellence I listed above? Can you improve any of the areas quickly while developing a plan to tackle the others? 3. Are your customers writing blog posts about your business like the one I just wrote about Amazon.com? How can you get them to become company evangelists? Now that you know how I feel about Amazon, I’d like to hear about your favorite companies or e-Commerce websites? Why are they your knee-jerk reaction for buying online?